Waybill from H.D. GREEN Wharfboat Proprietor at New Richmond, Ohio in 1884.Quaint old fashioned engraved vignette of a steamboat far left. 1887 waybill issued by J.W. Ashby & Co. that took on a partner and became Ashby & Hopkins Steamboat Agents and Proprietors of Wharf-Boats No 1 and 2 at Evansville, Indiana. This was an invoice for a wharfage fee to the Steamer J.P. DROUILLARD. 165 x 31.3 x 4.9. Named for an iron industrialist at Nashville and owned by the Ryman Line Ran Nashville-Paducah. Last inspected at Paducah Dec 22 1891. Sternwheeler built at Harmar, Ohio, at Knox Yard, 1865. 227 tons. Operated out of Zanesville, Ohio to Parkersburg, Marietta, and Beverly 1865-1873. First master, Capt. R.N. Cole, with J. H. Barker, clerk. Then Capt. Ed Martin, with Theo.McCadden, clerk. Then Capt. Jesse J Barr, with Charles Welch, clerk. Her U.S. inspection certification was allowed to expire in August 1873. 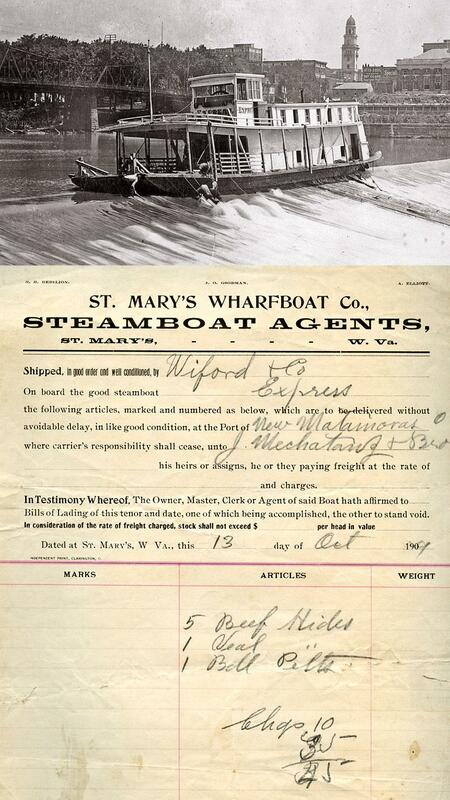 Written on the billhead of the Steamboat Agents aboard the Wharfboat at St. Mary's, West Virginia on October 12, 1909 for goods shipped aboard the gas operated towboat EXRESS (1909 - 1918) to New Matamoros, Ohio on the Ohio River. The photo from the La Crosse collection shows the EXPRESS in some peril as her portside is up against the edge of a spillway in the Ohio River at an unidentified river city. Some modern residents will recognize landmarks on the distant skyline. Three crewman appear to be risking their lives while working to get the EXPRESS off her precarious perch and back in navigable water. The receipt was written during the first year that the EXPRESS operated, the photo is undated. Strernwheeler built at California, Pennsylavania in 1865. 275 tons. 157 x 30 x 4. Owned by her master Capt. A.D. Russell and others of Allegheny County, Pa., and entered the Allegheny River trade, Pittsburgh-Oil City, with Albert Hancock, clerk. She was withdrawn late in 1866. T. H. Williams took the boilers out of the hold, decked her, and raised the cabin "materially improving her appearance." Brought her out May 1867 in the Pittsburgh-Cincinnati trade, selling her in mid-May to Capt. J B. Coffman who put her in the Cincinnati-Chilo trade in opposition to the MARY AMENT. Sold in August 1867 to Capt. Sam Houston who put on smaller engines, gave her a texas and lengthened the stacks for the Arkansas River. Sold in October 1868 to Tracy J Bronson, Franklin, La., Capt. Jesse P Forgay. Transferred October 1869 to Atakapas Mail Transportation Co., Franklin, La., Capt. H.H. Broad, master (whose name is on this waybill dated August 23, 1873). Ultimately she gravitated to Pensacola, Florida., owned by a stock company. Her machinery was taken out and she was broken up at Pensacola in December 1886. In a profile of Captain Adam Poe on georgetownsteamboats.com there is mention of the year that he owned the AMERICA (1866-67). "Captain Adam Poe bought a boat named the AMERICA in 1866. He operated the AMERICA for one year then sold her in 1867 because he was losing money." (This waybill is dated 1868, the year after Poe is said to have sold the AMERICA. It is possible that there was a batch of printed waybills left over from the year that Poe owned the boat and the new owners continued to use them until they ran out. One would have though that the new Captain would have had his clerk cross out Poe's name and written in by hand the name of the current man in charge). 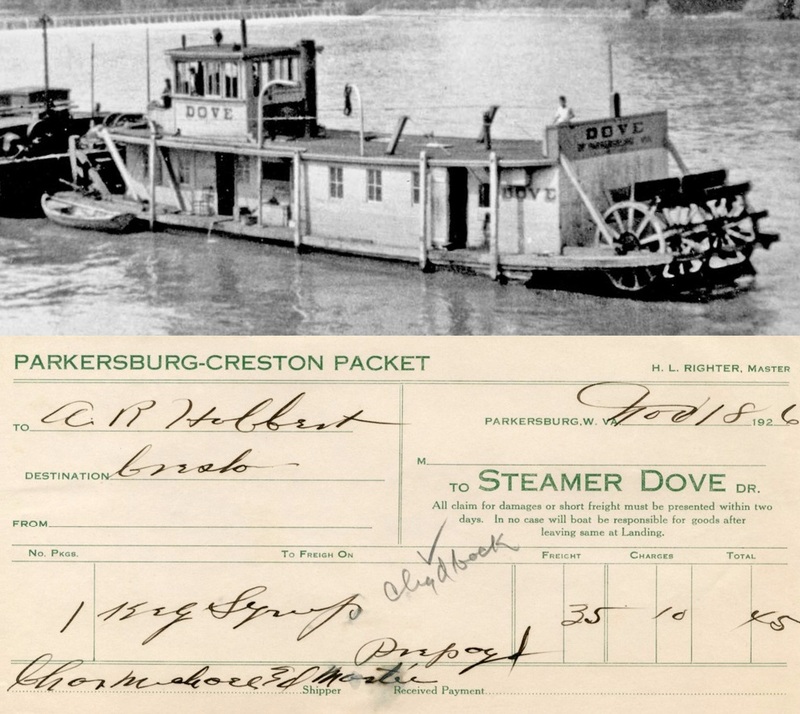 There were two steamboats name AMERICA running on the rivers during this period. A smaller sternwheeler and a huge "double decker" sidewheeler which collided with a big boat of the same design, ironically named the UNITED STATES, on the night of December 4, 1868 near Augusta, Kentucky, both boats caught fire and sank with the loss of an estimated 40 lives. It seems more likely that Poe owned the more modest sternwheeler although Poe is not mentioned in Fred Way's profile of that AMERICA which Fred concludes with a quotation from a Cincinnati newspaper after the loss of the AMERICA in ice two days before Christmas in 1871. The journalist wrote: "The AMERICA has always been considered a poor investment." Which confirms Poe's experience of the AMERICA being "a losing proposition." Construction was begun at Brownsville, Pennsylvania then completed at Pittsburgh in 1863. 165 x 32 x 4.5. Three boilers. Built by Capt. William Dean for the Pittsburgh-St. Louis trade. Usually in command of Capt. Thomas H. Golding. In September 1865, due to illness of Capt. Golding, Capt. 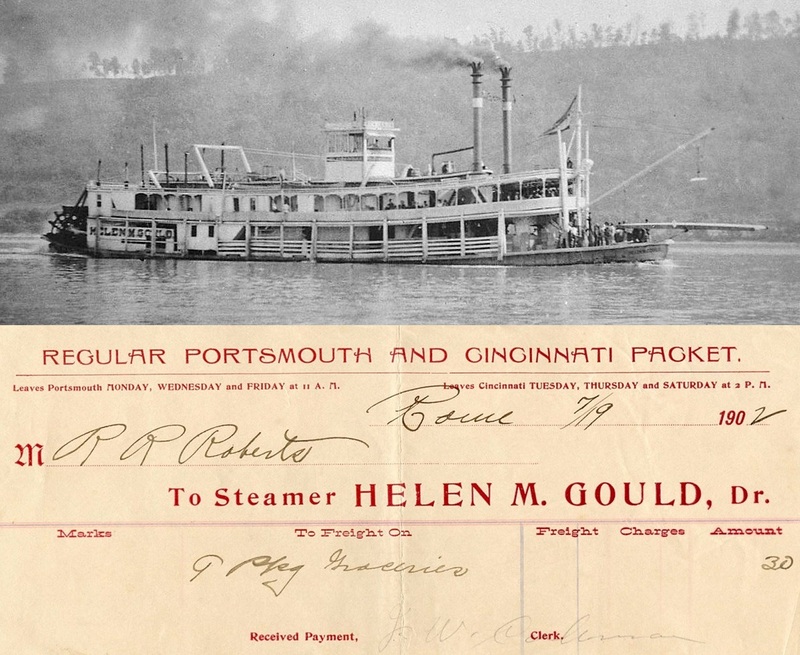 Sam Dean, "one of the oldest and most popular steamboatmen on the Western Waters," took her out of Pittsburgh on a St. Louis trip. William F. Blackstock, Allegheny City, was first clerk. She was sold to the Big Sandy Packet Co., in October 1868, and then ran Cincinnati-Pomeroy, Capt. Charles M. Holloway, master, with John Thornburg, clerk. Was in a near tornado at Portsmouth, Oh., in November 1869, but was safely landed after the sash departed from the pilothouse. About 1870 sold to Nashville & Cincinnati Packet Co., Capt. E. Pierce, master, with C .W Bradley, clerk. Downbound for Memphis on Dec. 23, 1871, she was cut down by ice opposite Madison, Ind. , with water over the cabin floor "The AMERICA has always been considered a poor investment," remarked the Cincinnati Commercial on Dec. 26, 1871. "Adam W. Poe was a well known riverman and grandson of the famous Indian fighter Adam Poe. Born on Wednesday, 20 Nov 1816, in New Lisbon, Columbiana Co, OHIO, he was the third child and third son of Thomas Washington Poe Senior and Elizabeth Hephner. After a short illness, Adam W. Poe died of pneumonia at his home in Georgetown at an early hour on Friday, 10 April, 1896. At the time of his death, he was 'extraordinarily well preserved, mentally and physically' according to his obituary in the East Liverpool Crisis dated 11 April 1896. Like his older brother Jacob, Adam's career as a steamboat pilot and owner of numerous packets witnessed the rise of steamboat commerce and its decline. He steamed on all the tributaries of the Mississippi, Ohio, and Missouri river systems. Starting at an early age, he traveled far, saw much, and accumulated great wealth." 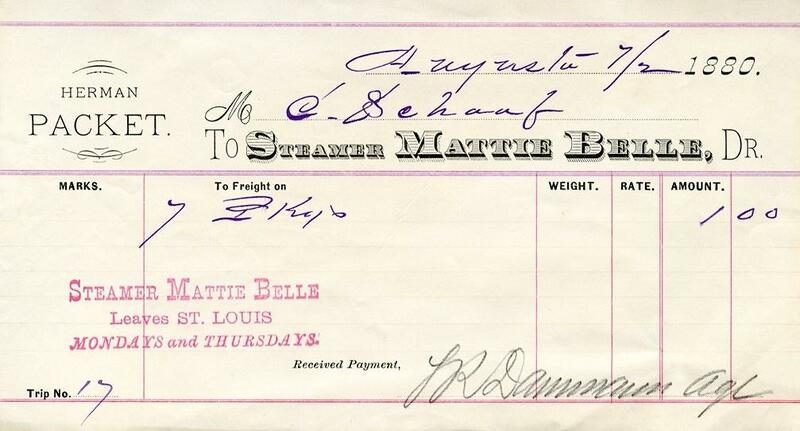 A neat waybill from the MATTIE BELLE (1875-1888) filled out at Augusta, Missouri on the Missouri River on July 2nd 1880. The name "Herman Packet" should actually have been spelled with two "N's" as in "Hermann Packet" referring to the celebrated little Missouri River town which was home port to the steamboating Heckmann family. Hermann has a lot of 19th century charm, ambiance and is decidedly picturesque. Attached is a panorama of Hermann taken from the hills on the east end of town looking west. I used several photos to make this wide composite, showing the Catholic church in the far distance on the left, the silver roofed Courthouse at Center, the river on the right and in the foreground one of the beautiful stone guest houses which contains several suites for overnight guests. The architecture is faithful to the town's unique style. There is a River Room on the 2nd floor of the old German School House with steamboat stuff a'plenty including a mock up of the PIN OAK's pilot house with the original pilot wheel in it. 173.2 x 26.2 x 4.2. Engines, 13's- 4 1/2 ft. Two boilers. In the Star Line, St. Louis-Kansas City, Capt. Ralph Whitledge. Ran competition with the R. W. DUGAN, Capt. W. L. Heckmann, Sr. The result was a rate war during which wheat was carried at three cents a sack and the DUGAN was wiped out. The Star Line folded later. Capt. E.W. Gould was master when she snagged at the foot of Cora Island, Missouri River, Aug. 25, 1879. Sold to St. Louis, Naples & Peoria Packet Co., Capt. James Abrams, and sank in winter quarters at St. Louis, Jan. 30, 1888. A waybill from BART ABLE, filled out on 11 May 1874 at "Egg Bend." Was pleased to locate Egg Bend with a Google search in Avoyelles Parish in Louisiana on the Red River at latitude 31.134 and longitude -92.19. Engines, 22's - 8 ft.
Three boilers, each 46" by 26 ft. When new she was taken down over the Falls to Portland, Kentucky, before her stacks were placed, smoke pouring from the breechings with Pinkey Varble piloting. She was built for the St. Louis-New Orleans trade, and ran in the Merchants & Peoples' Line, Capt. H.H. Symmes. Capt. Bart Able of St. Louis was an accomplished riverman and was selected chairman of the welcoming committee when U.S. President Andrew Johnson visited St. Louis in 1866. The BART ABLE was in the river parade from Alton to St. Louis on that occasion. She was sold to New Orleans and in 1867 Capt. W.C. Harrison had her running New Orleans-Shreveport. Harrison was part owner along with John G. Prather, W.H. Thorwegan and J.N Terrel of St. Louis. Capt. Richard Sinnott and others later ran her New Orleans-Grand Encore on Red River. They rebuilt her in 1872 and advertised her as the NEW BART ABLE, same trade. Dismantled in 1879. Her engines went to the JESSE K. BELL. A waybill filled in at "Eva" (short for "Evansville" apparently) on 19 May 1884 which is a couple of years after the ARIADNE was supposed to have had its name changed to the IDLEWILD and under that name finally sank at Kimmswick, Missouri in 1893. Suppose this could be an example of surplus waybills being used as receipts after a boat's name had been changed. Built at Cincinnati, Ohio, 1879. 200.6 x 35 x 5.5. Ran the "peanut trade" between Tennessee River and Cincinnati. When she was about two years old she was sold to the J. Moss Tie Co., Paducah, and was renamed IDLEWILD. A waybill filled out at Natchez in Sept of 1869, 8 months after the ARMADILLO had her broken shaft repaired 'way up the Ohio River at Pittsburgh far, far away. Built at Pittsburgh, Pa.in 1865. 157 x 33 x 5.7. Capt. D. H. Swaney, principal owner and master. First trip Pittsburgh to Nashville, February 1865 with Thomas S. Calhoon, clerk. Then went to St. Louis, same crew. Left Pittsburgh under the command of Capt. D.L. Hendrickson in mid-March 1866 for Council Bluffs, Iowa and Omaha, Nebraska with 200 emigrants, mostly farmers. That summer ran New Orleans-Shreveport under the command of Capt. Isaac Kouns, in place of the NAVIGATOR. Was towed from Grandview, Ohio, to Pittsburgh, Pennsylvania in early February 1869 with a broken shaft. Finally was dismantled at Cincinnati 1873, under the ownership of Messrs. Byers and Wolfe, and much of her equipment was used in their new boat the CHEROKEE.